Shared prosperity is one of the World Bank Group’s Twin Goals, introduced in 2013. Progress toward this goal is monitored through an indicator that measures the annualized growth rate in average household per capita income or consumption among the poorest 40 percent of the population in each country (the bottom 40), where the bottom 40 are determined by their rank in household per capita income or consumption. Chapter 2 of the 2018 Poverty & Shared Prosperity Report provides an update on the recent mixed progress on shared prosperity around the world in about 2010-15. The shared prosperity indicator was proposed as a means to shine a constant light on the poorest segments of the population in every country, irrespective of their level of development. Shared prosperity has no target or finish line, because the aim is to continuously improve well-being. In good times and in bad, in low and high-income economies alike, the bottom 40 percent of the population in each nation would be monitored. Tracking the bottom 40’s absolute growth as well as their growth relative to the mean is a way to remind us to always consider distributional impacts and strive for equitable outcomes. Despite its importance and universal relevance, shared prosperity is more challenging to monitor than global poverty. While one household survey is sufficient to calculate poverty, shared prosperity measurement requires two recent comparable surveys. The implication of this stronger data requirement is that 91 out of the 164 economies with an international poverty rate measured in PovcalNet are included in the 6th edition of the Global Database of Shared Prosperity (GDSP). 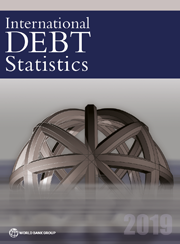 The 2019 edition of International Debt Statistics (IDS) has just been published. View the "about the data" section for a full description of the concepts and definitions in IDS. This year's edition is released just 10 months after the 2017 reference period, making comprehensive debt statistics available faster than ever before. It presents comprehensive stock and flow data for individual countries and for regional and analytical groupings. In addition to the data published in multiple formats online, IDS includes a concise analysis of the global debt landscape, which will be expanded on in a series of Debt Bulletin over the next year. Today, less than 10 percent of the world population lives in extreme poverty. Based on information about basic needs collected from 15 low-income countries, the World Bank defines the extreme poor as those living on less than $1.90 a day. However, because more people in poverty live in middle-income, rather than low-income, countries today, higher poverty lines have been introduced. These lines are $3.20 and $5.50 a day, which are more typical of poverty thresholds for middle-income countries. Today we’re (re)launching HEFPI—aka the Health Equity and Financial Protection Indicators database. HEFPI sheds light on two major concerns in global health: a concern that the poor do not get left behind in the rush to achieve global health goals; and a concern that health services should be affordable. Neither concern featured in the MDGs; both feature prominently in the SDGs. The HEFPI database draws on data from over 1,600 household surveys, including the Demographic and Health Survey and the Multiple Indicator Cluster Survey. Most of the 1,600 surveys have been re-analyzed in-house to ensure comparability across surveys and years, since published indicators from different surveys often use different definitions. We have settled on a definition based on recommendations in the relevant literature, and have used that across all surveys and time periods. As a result, the numbers in HEFPI are often different from (and more comparable than) numbers published elsewhere. The database is, in effect, the fourth in a series. The first was in 2000. That database focused entirely on MDG-era health service and health outcome data—so no financial protection data. It covered just 42 countries, each with one year’s worth of data. The second (in 2007) and third (in 2012) gradually expanded the scope, with the 2012 dataset covering both financial protection and health equity, and getting up to 109 countries, including some high-income countries. During the days coming up to, and after October 17, when many stories, numbers, and calls for action will mark the International Day for the Eradication of Poverty, we want to invite you to think for a second on what you imagine a poor household to be like. Is this a husband, wife, and children, or maybe an elderly couple? Are the children girls or boys? And more importantly, do all experience the same deprivations and challenges from the situation they live in? In a recent blog post and paper, we showed that looking at who lives in poor homes—from gender differences to household composition more broadly—matters to better understand and tackle poverty. Globally, female and male poverty rates—defined as the share of women and men who live in poor households—are very similar (12.8 and 12.3 percent, respectively, based on 2013 data). Even in the two regions with the largest number of poor people (and highest poverty rates)—South Asia and Sub-Saharan Africa—gender differences in poverty rates are quite small. This is true for the regions, but also for individual countries, irrespective of their share of poor people. Why is that the case? As Chapter 5 of the 2018 Poverty and Shared Prosperity Report explains, our standard monetary poverty indicator is measured by household, not by individual. So, a person is classified as either poor or nonpoor according to the poverty status of the household in which she or he lives. This approach critically assumes everyone in the household shares equally in household consumption—be they a father, a young child, or a daughter-in-law. By design, it thus masks differences in individual poverty within a household. Notwithstanding this shortcoming, when we look a bit deeper the information we have today still shows visible gender differences in poverty rates. Take age, for example. We know that there are more poor children than poor adults, and while we do not find that poverty rates differ much between girls and boys at the early stages of life, stark differences appear between men and women during the peak productive and reproductive years.